For parents, knowing how to teach your child to read can seem to be a mystical and fairly overwhelming task. For homeschool educators and teachers, addressing the needs of a struggling reader can be even more daunting. Both may ask, "Where do I begin?" 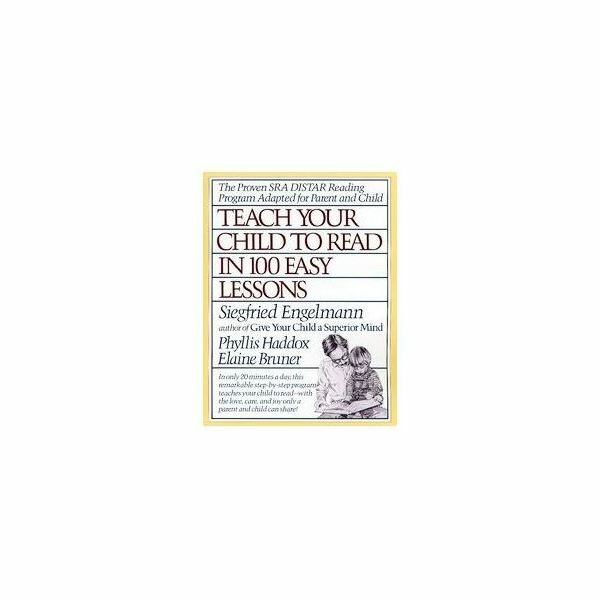 The book Teach Your Child to Read in 100 Easy Lessons, written by Siegfried Engelmann, Phyllis Haddox and Elaine Bruner, provides step-by-step script and instruction for guiding even the most reluctant reader. This review will demonstrate why this method of teaching reading continues to be a popular choice for parents and homeschool educators alike. The program and book, Teach Your Child to Read in 100 Easy Lessons, was developed as an extension of the school-based reading program Reading Mastery Fast Cycle I/II Reading Program (Engelmann & Bruner, 1988), sometimes referred to as Distar. Following the principles of Direct Instruction, the book emphasizes the explicit teaching of phonemic awareness (rhyming, blending, segmenting) along with 44 letter sound correspondences which enables the student to decode approximately 95% of the sounds they typically encounter when reading. Each lesson is broken into 20-minute segments, and offers parents or educators step-by-step instructions on what to say as the learner is guided through structured repetitions. Other activities designed to help you know how to teach your child to read include: rhyming, to promote word families based on common endings; letter writing practice; story reading, which involves successive segmenting and blending; and, picture comprehension – although pictures are only provided after the story is finished to assist with overall comprehension. The pace is controlled by the parent or homeschool teacher, and should be determined according to the individual student's level of comprehension. Although the authors recommend that only one lesson be taught per day, you can certainly make adjustments as needed to the format. When utilizing the program with struggling readers who already know the sounds of each letter, the lessons might go at a faster pace than when working with a student/child who is just beginning to understand the principles of reading and letter-sound correlation. According to most reviews, this program is intended for one-on-one interaction between a parent and child. However, its lessons can easily be utilized for individualized instruction in a co-op classroom setting. With the teaching text provided in the content of the lesson, it is easy for parents and classroom helpers to step in and conduct the lesson independent of the teacher. By the same token, lesson copies could be provided as homework when the student is absent or needs additional curriculum review. Parents, educators and children will be amazed at how easy the transition is from non-reader to reader while using this book! As a former Second Grade teacher and now the parent of 3 young readers, I can tell you that Teach Your Child to Read in 100 Easy Lessons was both easy to use and appropriately engaging for the short attention-span typical of young children. The provided script makes it easy to decode the mystery of understanding how to teach your child to read, and the frequent curriculum review provides numerous opportunity for mastery. Instilling a love for reading is one of the foundations for becoming a life-long learner, and that excitement will begin when your child or student proudly says, "I can read now!"